The3dForce: "The True Role Of The Third Party In The U.S. In The Current Political Environment", or "What Do We Really Need From The First Truly Third Political Party?" Also read "The Degradation of The White Male American Elite"
Today, 10/14/2018 I have learned that there is an organization Unite America, which offers a view similar to mine expressed in this post, which was written on 4/8/2017. I don't know yet anything about this group, except what the wiki say. Sorry, it is a long post, but nothing related to beating Trump is trivial, hence not easy or short. The central point of the post is simple: every politically active progressive person needs to make a choice; in 2018 and later, what is more important, "Bringing Democrats in Congress to the majority" or "Bringing Republicans in Congress to the minority"? Because "Bringing Republicans in Congress to the minority" is NOT the same as "Bringing Democrats in Congress to the majority". Hence, these two different goals will require two different political strategies. In particular, for "Bringing Republicans in Congress to the minority" the creation of the third political party may play a crucial role. There is almost nothing in the world that is absolutely good, or absolutely bad. Even poison can heal when used in small doses. I see at least one positive outcome from the Clinton's loss. Imagine that for a long period of time your stomach was giving you some issues: dull pain, gases, and eventually your doctor sent you to do CT scan. Turned out, you have a gastritis. However, the scan also captured some parts of your lungs. Turned out you also have an yearly stage of a lung cancer. Who knows how late could it be to catch the cancer if your stomach would not force you to get to the scanner. Now, at least, you have a good chance to treat it. A year or two without catching it up, and it could have been too late. During his election campaign Donald Trump was like that gastritis; worrisome, aching, but not deadly dangerous. The Election Day was like a CT scan, which showed that the problems were - and are - actually much more serious than almost everybody thought. This knowledge IS the positive outcome from the Clinton's loss. Hopefully, "the cancer" has not yet metastasized all over the "body". But it is clear that (a) we need a deep and serious analysis of all the reasons for the Trump's victory; and (b) the strategy to beat Trump's troops in 2018 and 2020 cannot be based just on the hope that people would eventually see how bad Trump is ("Trump is BAD" strategy did not lead Hilary Clinton to the victory; http://the3dforce.blogspot.com/2017/04/why.html); that strategy needs to be based on a drastic revision of all previously "obvious" knowledge about politics and approaches to do the politics. what do all these people: Deborah Wasserman-Schultz, Donna Brazile, Barack Obama, Vladimir Putin, Steve Bannon, Gary Johnson, Jill Stein – have in common? They all helped (differently, of course!) Donald Trump to become the President. I can feel the wave of resentment! How could I say that Obama helped Trump?! Please, calm down. I have my reasons to say what I just said. You do not have to agree with my reasons, but it could be useful to see the logic my reasons are based on. Deborah Wasserman-Schultz and Donna Brazile pushed for the wrong candidate, even when they needed to remain neutral. Barack Obama has disengaged from the internal party politics he was too neutral (even when Clintons pushed Biden out). Vladimir Putin created a massive cyber force specifically designed to help Trump to win. Steve Bannon designed the strategy for mass brainwashing and mind manipulation (which was and still is literally a copy of a KGB/FSB/GRU playbook on disinformation; just Google “disinformation”, or read memoirs of Ion Mihai Pacepa). Gary Johnson and Jill Stein took votes away from Hillary Clinton (for example, read http://www.msnbc.com/rachel-maddow-show/third-party-voters-played-key-role-election-results). If those Americans who voted for Gary Johnson or Jill Stein would be voting Democratic, Hillary Clinton would win (for better or worse – that is a different discussion). The last fact should present a pivotal point for all contemporary political strategists. Imagine, that two or three weeks before the election day, both, Gary Johnson and Jill Stein, would went on TV and said to their followers: “People, we understand your frustration with both major parties and both major candidates. We are grateful to you for your support. This election comes at the critical moment in the history of our Country. The result of this election will shape the Country for decades to come. We are realists, and we see that we have no chance to win. And the polls show that the election will be very close, practically unpredictable. That is why we decided to step down, to withdraw our candidacy, and we urge everyone of you to vote for Hillary Clinton”. There are no “backsies” in history, but I am positive that if Gary Johnson and Jill Stein would do that, they would swing the victory to Hillary Clinton. 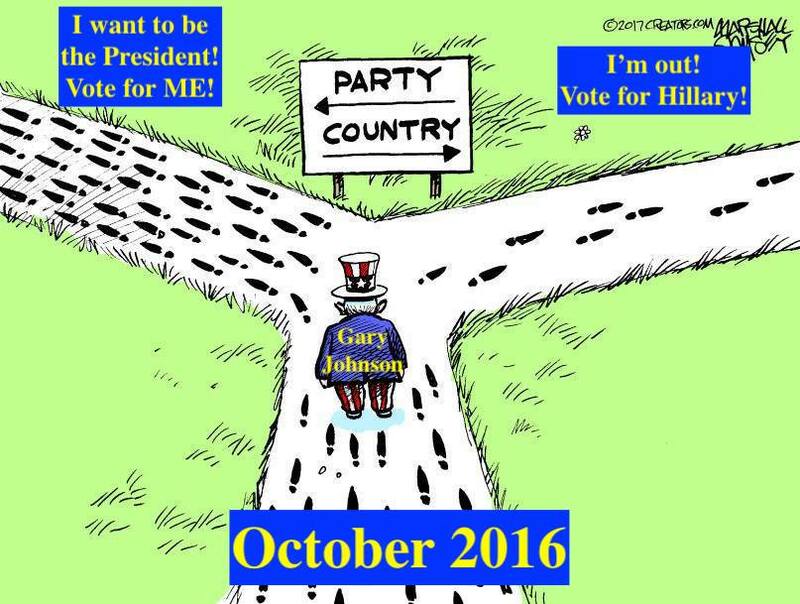 Unfortunately (from my point of view) both, Gary Johnson and Jill Stein, were too egoistic to withdraw from the race and held their own ego above the needs of the Country (exactly like Hillary Clinton). Or, maybe, they both were just politically ignorant to understand the true role a third party should play in a complicated political system. A case of a third party is a classic case of a coexistence of two large and one small political systems. For example, when a small country fears that a large neighboring country could invade it, it seeks a coalition with another large country, which has interests opposite to the first one. History has numerous examples of such coalitions; the latest one is the NATO (“small Europe” has a coalition with “big America” to be guarded from “big Russia”). In politics, however, small parties may play a crucial role and be a decisive political force. It is just a matter of (a) having a democracy, (b) math, and (c) willingness to suppress the own ego and provide a political support to a competitor (if it comes to that). Imagine, that some fictional country has a parliament with one hundred seats in it. After a general election two large parties have 44 seats and 41 seats (so, 85 together), and a third party has the rest. For a third party to have only 15 seats seems dismal. But without those votes (at least 7, or 10 to bring the total to 51) no bill can be approved, no law can pass, because neither of the large parties has a majority. That situation will force the other two parties to seek a coalition or at least a temporary agreement with the third one, even if the third party is very small. This situation will make the third party a decision maker, or at least a decision broker. For the large parties the existence of a third party gives them an opportunity to save their faces in front of their constituencies: “We did not give in to the adversaries, to get things done we forged a compromise using our friends from “the party #3”. According to a short article from 2011 https://www.good.is/infographics/infographic-what-congress-would-look-like-if-it-really-represented-america 46 % of the U.S. voters regularly vote mostly democratic, 41 % always vote for republicans, it leaves 15 % of voters who basically make their mind on the election day (see the introductory picture). Time goes, but this divide only sharpens and is expected to last for a decade or more. Clearly, the elections are won by those 15 % of voters who do not see themselves neither as democrats nor as republicans, but swing the power toward one or another depending on (… long talk). But major parties understand it. Both major parties now are regrouping the forces hoping to attract in 201, and 2020 the votes of those unenroled voters. However, the Democratic Party has a serious image problem, and a difficult internal struggle. There is a high probability that the Democratic Party will not be able to solve both those problems in time for the next elections. The "three party situation" is very well known in the history of the European politics. You can Google “the politics of coalition” and see how many books and papers have been written on this topic. However, the first thing you would notice is that all the top books are written about England, Germany, Europe in general, Brazil, India, and almost none about the American politics (for example, look up books by Michael Laver, Norman Schofield). The first listed paper related to the American politics addresses the issue of coalitions between African-American and liberal political movements; but there is nothing on the Congressional or Presidential elections. If you Google “what is the role of a third party?”, you find that third parties are “forcing major political parties to address new issues they might not have previously addressed very much”, and “third party candidates can also greatly impact an election by taking away votes from one of the major political party candidates” (that we already know!). And every source also tells us that in the foreseeable future it is very unlikely that in America a third-party candidate would win the Presidential elections. But that is exactly what a small third party does NOT even need to fight for! The main goal of a small third party should NEVER be winning the Presidential elections (people need to be realistic). If the party IS small, trying to win the Presidential elections only demonstrates that party members and leaders are delusional (or ignorant, or arrogant, or egoistic). The number one goal of a small third party should be preventing opposition from gaining seats. And, if possible, if it is realistic, to promote its own candidates into political power. The most important goal for an American small party (especially in 2018) should be taking in the Congress seats from Republicans; making Republican party to be the Congress minority. Ideally, the seats lost by Republicans would be taken by the third party candidates, but this goal is secondary (more on that in a couple of paragraphs). There is no doubt in my mind, that the current party line division will be a long-lasting fact of our political reality (at least one or two decades). That is exactly why a small political party has a very good opportunity to make a very big difference. When the two major parties will not have the majority in the Congress, and will not be able to find a compromise, the third-party caucus will become a mediator, a bridge builder, a deal maker. In my eyes, Libertarians and “Greens” had compromised themselves by not helping Clinton to win. Other existing parties have no influence on politics. That means, that a third party, which will play the role a third party needs to play in politics, has to be developed from a scratch. What do we need from the upcoming first truly third political party? I can answer this question only from my personal point of view. I am a pragmatic and a liberal, hence I am a pragmatic liberal. My philosophy is “pragmatical liberalism” (which means, I just use the best parts from all major philosophies). I believe in individual freedoms. But I also value the role of the Government. I consider myself smart, educated, honest, and active man, and among thousands of my former and current students and colleagues there is none who would call me a stupid, ignorant, lying​, or passive person (http://the3dforce.blogspot.com/2017/03/dusk.html). That is exactly what I also want to see in the members of the first truly third party. The party needs to value openness and honesty. That includes (a) having disclosed all the sources of the financial support; and (b) having rejected any private influence from any large donor. The party has to refuse the use of any brainwashing and mind manipulating techniques. So, when I would be listening to any party member, I would know that I could trust him or her. (a) fighting for the fairness for all. (b) no person can build his or her prosperity by exploiting other people. (c) establishing social and political mechanisms which will allow every American to succeed in his or her pursuit of happiness. (d) the continues improvement of work and living conditions for all American. Here comes the pragmatic part. 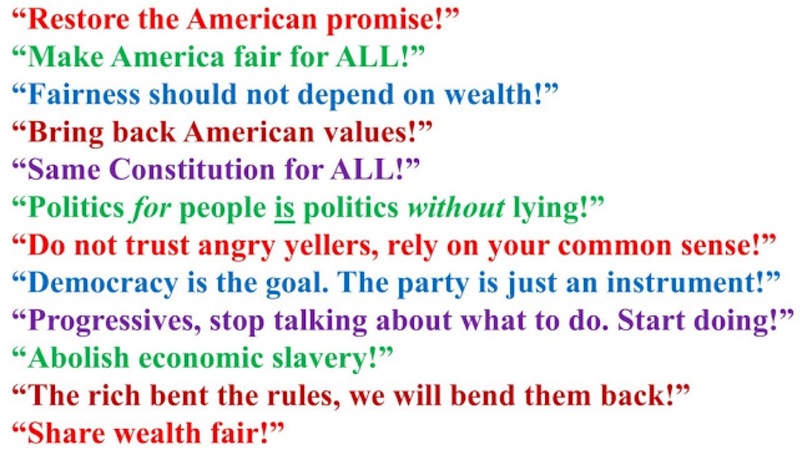 Every politician will quickly submit his or her name to these goals. But pragmatic liberals should establish clear and measurable criteria for every important aspect of those work and living conditions the party pledges to continually improve; the fairness for all has to be measurable – and measurable using the same standards for all! Due to the limitation on the size of this paper, I will give here only one example of a pragmatic approach to the politics. Democrats are very proud of the various regulations they had put in place to make the environment clearer. Republicans claim that those regulations “kill American jobs”. Do we need clean air and water to live a happy healthy life? Of course! Hence, the logic tells us, we need to regulate pollution and other aspects of human effects on the environment. Do regulations affect macro and micro economics? Of course! However, do we know the exact cost of that effect? No. But more importantly, we don’t even know what do small business owners hate the most about regulations? Based on listening to various conversations of “experts” and “pundits”, my impression is that the majority of small business owners do not see regulations as a big financial drag. So, why do the hate them? Many small business owners hate regulations because they have to spend a lot of time to fill up various paperwork to prove that they do not do anything bad; and that paperwork has to be approved in many places, and it all takes a lot of time. I have no specific data on this matter, because there are NO data! No one has researched the actual relationship between small business owners and federal regulations (which means that all the stamens on the issue have no logical foundation and based solely on ideological dogmas). Everything I said about regulations is purely my personal assessment. But based on this assessment, a smart pragmatic politician should say: “Ok, there are two most important variables in this case – money, and time. Let’s design – together with businesses – and conduct a research on how much time and money do our regulations cost to businesses.” And I am pretty sure that if the government would ask businesses to help them to design a simple and efficient technology which would allow small business owners to be in compliance with existing regulations without spending huge amount of time, many of them would be much less inclined against regulations per se. When I look at the current political landscape, I see that the Country is finally ready to accept the first truly third political party. This year (2017) should be the year when potential members would begin forming a movement. The movement should have a simple but memorable name – I personally love names like “The First Third American Party”, or “Pragmatic Liberals”. During this period members of the movement can keep all their current party affiliations. The next year should become the critical for the movement/party. The first decision to make will be to still remain being a movement, or to register an actual political party. No matter what decision will be made in 2018, movement or party members will need to participate in all available races. However, the quality of the members will have much more importance on the results of those races than the quantity. When a pragmatic liberal candidate will be in clear lead in a race, he or she becomes an active governing figure. However, in cases when a pragmatic liberal candidate has no chance of winning, two or three weeks before the Election Day he or she should call on the supporters to give their votes to … – well, this choice will require a judgment call. In this case, members of the party will have to calmly and logically analyze pros and cons of each remaining candidates and make the decision solely from the point of view of who will serve the Country better (I would expect that 99 % the third party would support the Democrat, or the Democrats would support the third party candidate). Building up political coalition should become one of the tools in the toolbox of the first truly third political party. American people are smart, and given the right choice they will support the party built on honesty and openness, and managed by the people and for the people. 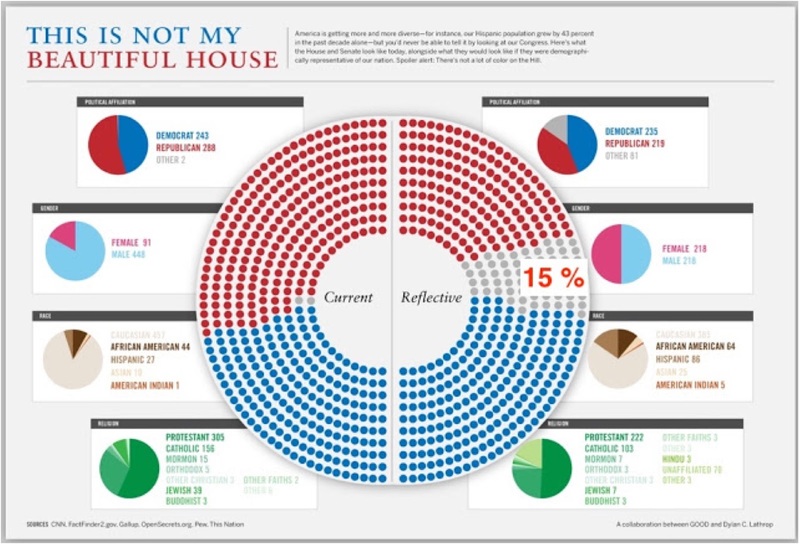 Statistics also shows that the Congress does not reflect the current demographic, economic, and ethnic distribution of Americans, and the political room for an active third party does exist (http://visual.ly/not-my-beautiful-house). The future of the Country needs to be in the hands of smart, educated, honest, and active pragmatic liberals. Becoming the decision brokers will be only the first stage of the party development. With the growth of the party the time will come when the third-party candidate will finally have a real shot for becoming the President of the United States of America. How should this type of party be created? I think, it should start from small local formations, "clubs", united by (a) the goal of bringing Congress Republicans to the minority; and (b) believing in the role the third political part has to play in politics (decision brokering). It would help to have a charismatic leader (Bernie Sanders?!). When he or she will get traction in the media, people will direct more and more of their attention to the party. Today Bernie Sanders' political group "Our Revolution" (https://ourrevolution.com/) presents the closest approximation to the first truly third political party. However until this movement remains inside the Democratic Party, it will not be able to attract moderate Republicans and "radical" independent (who would never vote for Democrats). The “Our Revolution” movement offers a very inspirational platform, no doubts about that. But if 2016 taught us anything, it is that there is a big difference between saying all the right words, and being able to deliver, being able to win. In order to win, a social group needs to use a right political mechanism. The Democratic Party is at the edge of making serious changes in the way it functions. In 2016 Clinton's "clique" forced all prospective presidential candidates to step away (even Biden!). If it wasn't for independent Bernie Sanders, Democrats would not even had a contest. Then, the same "clique" stacked the deck against Sanders. And now they want to "unite" the party, meaning, making Sanders' supporters to agree with the views imposed by rich donors. Clearly, the Democratic Party has two very different factions. One faction represents people who believe that if it was not for KGB/FCB/GRU and FBI Hillary Clinton would win. This faction has no nationally recognized democrats who would be brave enough to stand up against Clintons. Sanders' supporters will never agree with Clintons' views, but many of them are afraid of leaving the party. As the result, we will be seeing long internal arguing, which will keep the party week. Democrats want to hit Republicans with a fist, but due to internal squabbling all they will be able to produce is a slap (at the best). If "progressive" Democrats would leave "regular" Democrats", each of the two new parties would be able to make a fist to hit Republicans. The new small party would be able to attract people who did not vote and will not for Clinton or Clinton-alike "establishment" candidates (because they know that her ego goes ahead of everything else; and because they do not want to vote for people backed by reached donors). The remaining Democratic Party will be able to concentrate on fighting Republicans using means which would not repulse large donors. But - and this is very important - these two parties will NOT be enemies (like "Draft Bernie" people v. Democrats; http://the3dforce.blogspot.com/2017/04/draftbernie.html). These two parties are allies! (at least for a foreseeable future) They have a mutual enemy - Republicans! When elections happen, they will present their own candidates. But they will need to make a pact; three weeks before the voting day, whichever candidate gets more traction, that candidate will get the full support of the both parties. This is the best strategy to beat Republicans in 2018 and 2020. The Biggest Lesson From The Election: What Did the Democrats do Wrong? Liberals! Stop living in a bubble! Who will be the real President of the United States? Statement of Massachusetts Democratic Committee. Why did Hillary Clinton Lose the Race? What Could Liberals Learn From Physics? Intellectual stagnation, social conformism, and the crisis of logical communication. American Republicans are just Russian Bolsheviks! The election is just over. What's now? To everyone who has been emotionally attacked, called names, threatened, verbally degraded! “A failure of imagination” has lead to 11/08/2016. Were Democrats Doomed, or There Was a Path to The Victory, and Does It Still Exist?